More and more of us are switching to LED bulbs in our homes – now a Queensland research team led by QUT scientists wants Australia's street lights to be switched over to LEDs. A 12-month LED street lighting trial in Brisbane, Ipswich and Townsville has just wrapped up, with great results for the environment and the public purse. Researchers switched over sections of street lighting to bright LED lights that exceeded the road lighting requirements of the relevant Australian Standards and still found power savings of up to a massive 82 per cent. The trial was facilitated by the Guided Innovation Alliance (GIA) – a group pushing innovations in the electricity sector and made up of QUT, Ergon Energy, and SmartGrid Partners. "Public street lighting is the single largest source of greenhouse gas emissions for local government in Australia and is estimated to cost councils more than $250 million a year," said Dr Gillian Isoardi, a QUT researcher and lecturer in optical physics who is part of QUT's Institute for Future Environments. "Compared with High Intensity Discharge (HID) lights, LED street lighting offers significant energy savings of up to 60 per cent, demand reductions and large maintenance savings from long design life (up to 20 years). "New advancements in LED street light control mean they can also be dimmed when and where appropriate, which can further increase energy savings to 80 percent." The study results will be discussed at a free forum for government and industry on Friday, October 21, at QUT's Institute for Future Environments. Dr Isoardi said the symposium – Bright Ideas: Smart Lighting for Smart Cities – would give the research team a chance to push the advantages of LED street lights, backed by data from the trial. 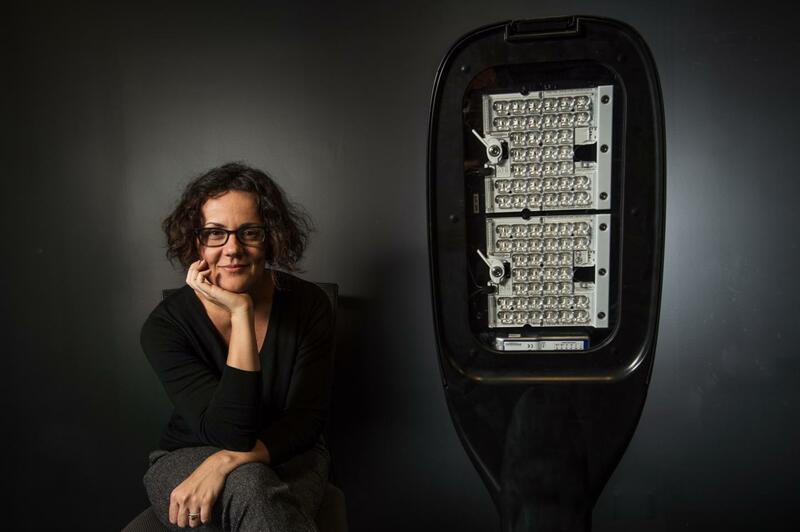 "LED streetlights are evolving over the world and have already been installed in countries including the USA, Canada and the United Kingdom," she said. "In addition to energy savings, 'smart' street lights are also being enabled to act as sensor networks, collecting and communicating data relevant to transport, environment, city management, energy, safety and security service applications. New technology LED street lights have the capacity to include features like digital signage, CCTV, speakers, 'push to talk' emergency systems and even electric vehicle charging. "Australia has been slow to uptake the technology due to uncertainty about technical performance, a lack of new funding models and ongoing questions of ownership between network utilities and local government. The Brisbane forum on October 21 will present the results of our technical research and other project outcomes to move the agenda forward." The LED trial involved sections of street lighting in Brisbane, Townsville and Ipswich. "The Brisbane trial took place on the roadways surrounding the Brisbane Airport Skygate Centre where 98 Metal Halide and High Pressure Sodium (HPS) streetlights were replaced with 104 LED streetlights," Dr Isoardi said. "The new LED luminaires had dimming capabilities and could be addressed individually by wireless communication. LED replacements were applied to the existing poles, and when operated at 100 per cent power the new LED installation consumed approximately 67 per cent less power than the previous lights. The annual energy usage decreased from 119.8 MWh to 39.3 MWh. "Three locations in Townsville were the subject of LED streetlighting assessments: the Townsville Civic Theatre Car Park, Murray Lyons Crescent at the RSL Sports Complex Annandale, and Stokes Street in the Townsville CBD. "In each location, new LED streetlights that were dimming capable and individually addressed by wireless communication were used on the existing poles as replacements for older lamp types. "Over the course of a year, the annual energy consumed at the Murray Lyons Crescent site decreased from 9.19 MWh to 4.40 MWh (a 52% reduction). For Stokes Street, it dropped 70 per cent from 13.75 MWh to 4.06 MWh. At the Civic Theatre Carpark, energy savings of 82 per cent were achieved through the active control (dimming) of light levels, dropping the annual energy usage from 43.6 MWh to 7.97 MWh. "At Ipswich, we trialled 53 LED luminaires (ranging from 28W to 158W) in the road network within Queen's Park, which replaced 28 fluorescent, HPS and Mercury Vapour lights. The new lighting design was quite different to the old one and covered a greater area which meant we couldn't do a direct comparison of overall energy savings. But we did compare two locations, the Nursery Car Park and Entrance Road, where the lights were brighter than the relevant standards required, which meant we could dim them by 20 per cent and reduce energy consumption by a similar amount." Ms Isoardi said the GIA trials had validated claims that LED street lighting would provide large savings in energy consumption and the associated costs. "We believe the data provides support for a broad-based roll out of the technology," she said. "We are advocating this roll out be done through a process involving laboratory testing, in-field demonstrations, monitoring, community acceptance and the development of assessment processes and funding options for local governments and utilities." The LED street lighting trial was supported by grant funding from the Australian Government's Clean Technology Innovation Program (CTIP), and supported by participating organisations including the Brisbane Airport Corporation, Townsville Community Council, Ipswich City Council and Queensland Department of Main Roads. The October 21 symposium will run from 9am to 10.45am at QUT's Institute for Future Environments on the Gardens Point campus and will be hosted by the Guided Innovation Alliance. It is booked out but will be livestreamed to the public.